Paraneoplastic encephalomyelitis (PEM) is a multifocal inflammatory disorder of the central nervous system (CNS) associated with remote neoplasia. Frequently, the disorder is accompanied by subacute sensory neuronopathy (SSN) due to involvement of the dorsal root ganglia. Anti-Hu antibodies may be detected in both of these conditions. Although various malignancies have been reported in PEM, 80% of cases are associated with bronchial cancer, typically small cell lung carcinoma. Neurologic manifestations commonly precede the diagnosis of cancer, although variable presentations have been reported. Symptoms usually progress over the course of weeks to months, reaching a plateau of neurologic disability. Neurologic impairment may be more debilitating than the associated cancer. No effective therapeutic approaches have been established, although immunosuppressive therapies are commonly used. See the images below. Other PEM antibodies include anti-CV2, anti-Yo, anti-Ma1, anti-Ta or anti-Ma2, anti-LGI1, and several other atypical antibodies. The targets of such antibodies may be quite varied, including neuropil and intraneuronal sites. Voltage-gated potassium channel antibodies may be associated with nonparaneoplastic limbic encephalitis. Recent reports have noted detection of the prion-related 14-3-3 protein  and of herpes simplex virus  by PCR in the cerebrospinal fluid (CSF) of patients with PEM. The significance of these findings is unclear. The incidence of PEM is unknown. PEM affects approximately 0.4% of patients with bronchial carcinoma. Increased recognition of clinical manifestations may provide estimates of incidence in the future. PEM has a variable and unpredictable course. Progressive evolution of neurologic dysfunction may lead to coma and death in a few patients. Most patients experience severe neurologic impairment with susceptibility to related medical complications. PEM occurs most frequently in middle-aged or older adults with small-cell lung carcinoma. It may occur in younger individuals with other types of cancer. Blaes F. Paraneoplastic neurological syndromes--diagnosis and management. Curr Pharm Des. 2012. 18(29):4518-25. [Medline]. Shirafuji T, Kanda F, Sekiguchi K, Higuchi M, Yokozaki H, Tanaka K, et al. Anti-Hu-associated paraneoplastic encephalomyelitis with esophageal small cell carcinoma. Intern Med. 2012. 51(17):2423-7. [Medline]. Graus F, Saiz A, Lai M, Bruna J, López F, Sabater L, et al. Neuronal surface antigen antibodies in limbic encephalitis: clinical-immunologic associations. Neurology. 2008 Sep 16. 71(12):930-6. [Medline]. Benyahia B, Liblau R, Merle-Beral H, et al. Cell-mediated autoimmunity in paraneoplastic neurological syndromes with anti-Hu antibodies. Ann Neurol. 1999 Feb. 45(2):162-7. [Medline]. D'Alessandro V, Muscarella LA, Copetti M, Zelante L, Carella M, Vendemiale G. Molecular detection of neuron-specific ELAV-like-positive cells in the peripheral blood of patients with small-cell lung cancer. Cell Oncol. 2008. 30(4):291-7. [Medline]. Lai M, Huijbers MG, Lancaster E, Graus F, Bataller L, Balice-Gordon R, et al. Investigation of LGI1 as the antigen in limbic encephalitis previously attributed to potassium channels: a case series. Lancet Neurol. 2010 Aug. 9(8):776-85. [Medline]. Aguirre-Cruz L, Charuel JL, Carpentier AF, et al. Clinical relevance of non-neuronal auto-antibodies in patients with anti-Hu or anti-Yo paraneoplastic diseases. J Neurooncol. 2005 Jan. 71(1):39-41. [Medline]. Saiz A, Graus F, Dalmau J. Detection of 14-3-3 brain protein in the cerebrospinal fluid of patients with paraneoplastic neurological disorders. Ann Neurol. 1999 Nov. 46(5):774-7. [Medline]. Sharshar T, Auriant I, Dorandeu A, et al. Association of herpes simplex virus encephalitis and paraneoplastic encephalitis - a clinico-pathological study. Ann Pathol. 2000 May. 20(3):249-52. [Medline]. Foster AR, Caplan JP. Paraneoplastic limbic encephalitis. Psychosomatics. 2009 Mar-Apr. 50(2):108-13. [Medline]. Adam VN, Marin D, Budincevic H, Mrsic V, Goranovic T, Tonkovic D. [Paraneoplastic limbic encephalitis]. Acta Med Croatica. 2012 Mar. 66(1):29-32. [Medline]. Maddison P, Lang B. Paraneoplastic neurological autoimmunity and survival in small-cell lung cancer. J Neuroimmunol. 2008 Sep 15. 201-202:159-62. [Medline]. Shavit YB, Graus F, Probst A, et al. Epilepsia partialis continua: a new manifestation of anti-Hu-associated paraneoplastic encephalomyelitis. Ann Neurol. 1999 Feb. 45(2):255-8. [Medline]. Saiz A, Blanco Y, Sabater L, González F, Bataller L, Casamitjana R, et al. Spectrum of neurological syndromes associated with glutamic acid decarboxylase antibodies: diagnostic clues for this association. Brain. 2008 Oct. 131:2553-63. [Medline]. Mihara M, Sugase S, Konaka K, et al. 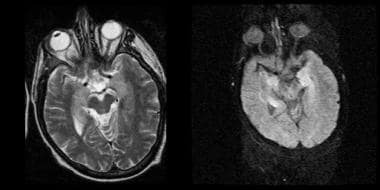 The "pulvinar sign" in a case of paraneoplastic limbic encephalitis associated with non-Hodgkin's lymphoma. J Neurol Neurosurg Psychiatry. 2005 Jun. 76(6):882-4. [Medline]. Wingerchuk DM, Noseworthy JH, Kimmel DW. Paraneoplastic encephalomyelitis and seminoma: importance of testicular ultrasonography. Neurology. 1998 Nov. 51(5):1504-7. [Medline]. Honnorat J, Antoine JC. Paraneoplastic neurological syndromes. Orphanet J Rare Dis. 2007 May 4. 2:22. [Medline]. Dropcho EJ. Paraneoplastic Diseases of the Nervous System. Curr Treat Options Neurol. 1999 Nov. 1(5):417-427. [Medline]. Keime-Guibert F, Graus F, Broet P, et al. Clinical outcome of patients with anti-Hu-associated encephalomyelitis after treatment of the tumor. Neurology. 1999 Nov 10. 53(8):1719-23. [Medline]. Keime-Guibert F, Graus F, Fleury A, et al. Treatment of paraneoplastic neurological syndromes with antineuronal antibodies (Anti-Hu, anti-Yo) with a combination of immunoglobulins, cyclophosphamide, and methylprednisolone. J Neurol Neurosurg Psychiatry. 2000 Apr. 68(4):479-82. [Medline]. Shams'ili S, de Beukelaar J, Gratama JW, Hooijkaas H, van den Bent M, van 't Veer M, et al. An uncontrolled trial of rituximab for antibody associated paraneoplastic neurological syndromes. J Neurol. 2006 Jan. 253(1):16-20. [Medline]. Ances BM, Vitaliani R, Taylor RA, et al. Treatment-responsive limbic encephalitis identified by neuropil antibodies: MRI and PET correlates. Brain. 2005 Aug. 128(Pt 8):1764-77. [Medline]. Bakheit AM, Kennedy PG, Behan PO. Paraneoplastic limbic encephalitis: clinico-pathological correlations. J Neurol Neurosurg Psychiatry. 1990 Dec. 53(12):1084-8. [Medline]. Compta Y, Valldeoriola F, Urra X, Gómez-Ansón B, Rami L, Tolosa E, et al. Isolated frontal disequilibrium as presenting form of anti-Hu paraneoplastic encephalomyelitis. Mov Disord. 2007 Apr 15. 22(5):736-8. [Medline]. Dalmau J, Graus F, Villarejo A, et al. Clinical analysis of anti-Ma2-associated encephalitis. Brain. 2004 Aug. 127(Pt 8):1831-44. [Medline]. de Beukelaar JW, Sillevis Smitt PA. Managing paraneoplastic neurological disorders. Oncologist. 2006 Mar. 11(3):292-305.
de Beukelaar JW, Sillevis Smitt PA, Hop WC, Kraan J, Hooijkaas H, Verjans GM, et al. Imbalances in circulating lymphocyte subsets in Hu antibody associated paraneoplastic neurological syndromes. Eur J Neurol. 2007 Dec. 14(12):1383-91. [Medline]. de Graaf M, de Beukelaar J, Bergsma J, Kraan J, van den Bent M, Klimek M, et al. B and T cell imbalances in CSF of patients with Hu-antibody associated PNS. J Neuroimmunol. 2008 Mar. 195(1-2):164-70. [Medline]. Gultekin SH, Rosenfeld MR, Voltz R, et al. Paraneoplastic limbic encephalitis: neurological symptoms, immunological findings and tumour association in 50 patients. Brain. 2000 Jul. 123 ( Pt 7):1481-94. [Medline]. Inuzuka T. Autoantibodies in paraneoplastic neurological syndrome. Am J Med Sci. 2000 Apr. 319(4):217-26. [Medline]. Provenzale JM, Barboriak DP, Coleman RE. 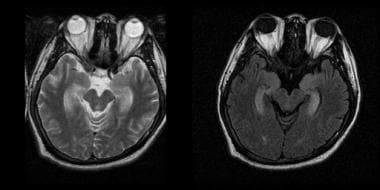 Limbic encephalitis: comparison of FDG PET and MR imaging findings. AJR Am J Roentgenol. 1998 Jun. 170(6):1659-60. [Medline]. Sabater L, Gomez-Choco M, Saiz A, Graus F. BR serine/threonine kinase 2: a new autoantigen in paraneoplastic limbic encephalitis. J Neuroimmunol. 2005 Dec 30. 170(1-2):186-90. [Medline]. Scaravilli F, An SF, Groves M, Thom M. The neuropathology of paraneoplastic syndromes. Brain Pathol. 1999 Apr. 9(2):251-60. [Medline]. Tani T, Tanaka K, Idezuka J, Nishizawa M. Regulatory T cells in paraneoplastic neurological syndromes. J Neuroimmunol. 2008 May 30. 196(1-2):166-9. [Medline]. Vincent A. Antibodies associated with paraneoplastic neurological disorders. Neurol Sci. 2005 May. 26 Suppl 1:S3-4. [Medline]. Vincent A, Buckley C, Schott JM, et al. Potassium channel antibody-associated encephalopathy: a potentially immunotherapy-responsive form of limbic encephalitis. Brain. 2004 Mar. 127(Pt 3):701-12. [Medline]. Voltz R, Gultekin SH, Rosenfeld MR, et al. A serologic marker of paraneoplastic limbic and brain-stem encephalitis in patients with testicular cancer. N Engl J Med. 1999 Jun 10. 340(23):1788-95. [Medline]. Mesial temporal hyperintensity demonstrated on T2-weighted (left) and fluid-attenuated inversion recovery (FLAIR, right) MRI.